The Quebec government said it’s monitoring water levels as heavy rains in regions including the Beauce and Eastern Townships are resulting in overflowing rivers. 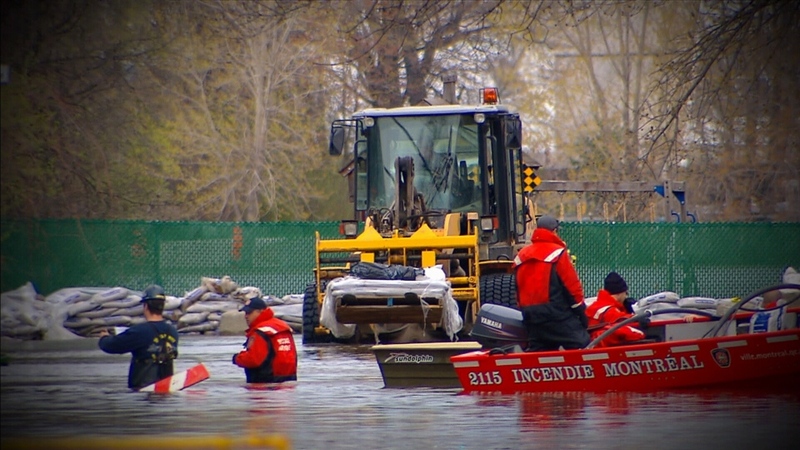 The flood watch comes as Public Security Minister Genevieve Guilbeault announced a new program to compensate those affected by floods. “It will make their life simpler and easier. It will reduce bureaucracy, it will speed up the processing of the files and let them know in advance the amounts to which they are entitled,” she said. Under the new plan, disaster victims are entitled to $20 each per day if they need temporary lodging and food. After 100 days, they'll receive $1,000 per month. Homeowners will receive up to $5,000 to reimburse preventative and temporary protection that's required during a flood. There's also money to replace appliances if they’re damaged – and flood victims won’t need to provide receipts. A homeowner on affected flood plains would be entitled to $200,000 to move. “If he or she chooses to stay there, they won't be eligible for any more funding,” said Guilbeault. Towns have to be proactive to prevent more disasters, said Hudson Mayor Jamie Nicholls, who was among the local mayors listening closely to the new plan. “The Town of Hudson has taken the precautionary measure to not allow construction in the 20-100 flood plain, so we're ahead of the game to make sure there's no new construction in the flood plain because we all know that climate change is upon us and we have to take responsibility as a government,” he said. In case of flooding, are you prepared?